Directly on the beach, this villa called "Escape with the sound of the waves" guarantees you a stay full of peace. You will have the pleasure of waking up with a wonderful view of Monserrat Island, the Karouane hamlet, Tête de l’Anglais, and seeing an exceptional sunset. Close to one of the most beautiful beaches of the island, it offers also a beach below, favourable to the romantic evenings, with the good flavours of our exotic cocktails with the light of the torches. Friendly, energetic, mother and son who want to share this small paradise. Our wish is to make you discover our villa located in a charming setting, favourable to a complete relaxation of the body and the spirit, and with the sound of the waves. We will be able to guide you and to give you all the attractive points of our island to enjoy the local products. There is a bathroom accessible for people with mobility impairments. View of the sea and the hamlets. The house is accessible for people with mobility impairments, easy movements in the villa, not staircase, on one level. Nous avons passé une semaine et avons beaucoup aimé. Un accueil chaleureux et personnel. La maison est spacieuse et confortable. Nous retourneront!!! 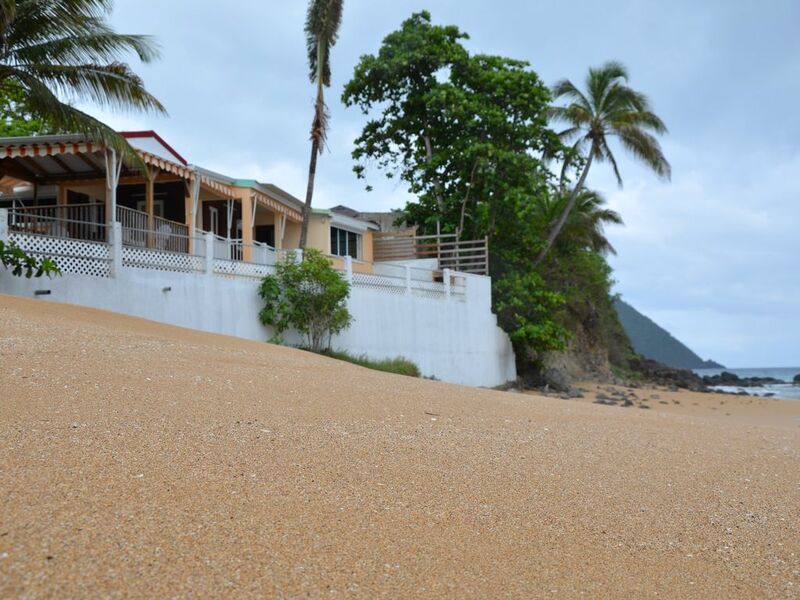 This is a very uniquely situated property directly on the beach with panoramic views in all directions. It is like having your own private beach as there is rarely anyone on it, Stunning views of the sunset every night. Comfortable and well equipped. THANK YOU ? ALL THE PLEASURE OF YOU RECEIVE US. The other reviews were spot on. Superb location on a semi-private beach, snorkeling out front, often a cool breeze that helped with the mosquitos, felt safe/secure, and caretakers were friendly and available. Our 1 & 2 year old were well contained on the large fenced in patio, a high chair, two pack n plays (but one ended up sleeping under mosquito netting), and even a toddler wash bin for the shower. Hopefully future guests will be able to enjoy the inflatable toddler bedrails we left behind. There is even a kids' playground on way to Cherry's Pizza. Thank you so much for sharing your home with us! We want to preserve the well-being of our guests. Mosquitoes pass but by protecting ourselves we take advantage of nature. We were very happy and impressed with this seaside property. The patio is large, covered and comfortable with a view to die for. The owners made us feel very welcomed and even brought over a beautiful fresh punch and wonderful fritters as a welcome gift. The kitchen is large and well equipped, comfortable bedrooms and new showers through out. There's even a washing machine. The property is quite close to shopping, restaurants, a botanical garden and lovely beaches. The beach the house sits on is gorgeous. We will be coming back to this lovely place. We were wery satisfied and impressed by the setting of this spatious house. Right on the beach (which is still sandy after the hurricane compared to others). House is clean and so is the beach. Even moskytos were not so bad as expected. Landlady very helpful and welcoming. We have stayed in other places on the island but this one is the best value for money! !